If your family is anything like mine, they come in the door and drop everything on the floor in the entryway. Shoes, boots, coats, hats, gloves, book bags, purses, keys, the dog’s leash, and umbrellas. Before you know it, you have a huge pile in front of the door. If your luck is anything like mine that will be the moment someone from the church will show up unexpectedly, just to say hello. Now you will have to decide whether to leave them waiting at the door while you frantically throw the huge mess into the nearest closed room, or let them in to see your messy entryway. If what they say about first impressions is true, then it will not matter if the rest of the house is pristine, what the entryway looked like will be what they remember. A nice coat rack is always a plus, but what about all that other stuff like shoes and boots, keys, bags, umbrellas and the dog’s leash? What you need is an entryway bench with shoe storage like our top pick the Winsome Dayton Storage Hall Bench with Shelves. Its walnut color and real wood construction make it an elegant addition to the appearance of your entryway. It has storage drawers for those little extras and enough space for 12 pairs of adult size shoes. An entryway bench like this can give you a place to sit to put on or take off your shoes, or it can serve as a place for the kids to put their book bags when they get home from school. The key to a neat and tidy entryway is organization. If there is a place right near the door for everyone to put their things in an orderly fashion, your entryway will maintain a tidy appearance, and will not embarrass you when those unexpected visitors arrive. A shoe storage rack will make it easy to organize everybody’s shoes and keep them from piling up in the entryway. A few drawers or baskets under the bench can be the perfect place to store smaller things like keys, umbrellas, and the dog’s leash. Another problem these benches solve is having a place to sit while putting on or taking off your shoes. This will make the process so much easier and people will not be tempted to go into the living areas of your house for a place to sit, keeping the dirt that may come off their shoes in the entryway instead of in your home. The first benefit of buying an entryway bench with shoe storage is the immediate improvement in the appearance of your entryway. Instead of a pile of random shoes and bags, you will have an organized center for things to be put in their place. This will help with that first impression that people have when they enter your home for the first time. In their minds, a neat and tidy entryway will equal a neat and tidy home. Another benefit is that you will have somewhere for yourself and others to sit down when taking off or putting on their shoes when entering or leaving your home. If you have ever had to stand in someone’s entryway and try to tie your shoes without falling over or looking foolish you will understand the need for somewhere to sit. This will also keep your family and guests from going into other areas of the house to find a place to sit, keeping dirt that may be carried in on their shoes in the entryway. Cushioned seats are also a plus for those who like a more comfortable place to sit. Many entryway benches also include drawers that make it easy to hide items that accumulate near the door such as keys, umbrellas, dog leashes, and mail. This will keep these items from accumulating on tables or cupboards throughout the house, and make them easy to find when they are needed. What Makes a Great Entryway Bench with Shoe Storage? 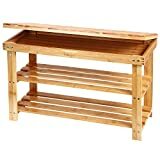 Entryway benches with shoe storage come on many sizes and styles. Some are small and simple. Others large and elaborate. Some have baskets, cubbies, or shelves. So how do you sort through all the choices and pick the best one. The style and look of the bench is important. What does it add to the look of your home? A good bench should by classy and elegant enough to add style to any home. It should not look cheap or gaudy. Some other things to look for are size. The best benches should be of an adequate height so that when you sit on them you will not have difficulty getting up again. They also need to be deep enough, (the distance out from the wall) to make it easy to sit on. Sturdy construction is necessary. If the bench is flimsy with use over time, it may break or become wobbly. A good sturdy bench with real wood construction fits the bill. Any drawers or baskets should also be well constructed. Drawer should be easy to open or close and the material baskets are made of should not have any odor or crack, break, or chip easily. Another consideration is the size of the compartments for shoe storage. Will an average pair of adult shoes fit in it? A good shoe storage compartment should make it easy to store pairs of shoes together, whether it is an adult or child’s shoe, or a woman’s high heels. Any drawers should also be high and deep enough to easily store items such as keys, leashes, and compact umbrellas. 3 shelves that will fit 4 pair of adult shoes each. The Winsome Dayton storage bench with shelves has everything you can ask for in an entryway bench with shoe storage. It has elegant style and its walnut color can fit well with many types of décor. 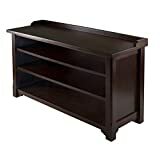 It has solid real wood construction and it is tall enough to get up and down from easily. Its three shelves are removable and adjustable and allow you to store up to twelve pair of adult size shoes easily. There are three storage drawers for storing those extra items in. There is a cushion available that fits this bench, which must be purchased separately unfortunately. The most common complaint is difficulty putting it together. However, many people also said it was easy to put together so take it with a grain of salt. I do want to point out that many recommend skipping step 4 in the instructions and putting the shelves in last. If you consider yourself handy or you’ve ever conquered a piece of IKEA furniture I’m confident you’ll have no problems. If you’re worried about what to do with the bench should you not like it by the door or ever move to a place without a sizeable entrway there are other uses for this item such as a bench for seating and storage in a bedroom or bathroom. Some buyers planned to use it as a TV stand. Instead of using the bench as a place to sit, it could easily be used to store backpacks, purses, or baskets for hats, gloves, and scarves. That’s what I call bang-for-the-buck! No extra storage for keys, mail, etc. The SONGMICS metal shoe bench is my second choice because of its heavy-duty durable metal construction, which can hold up to 440#, and it’s crazy affordable price. Its faux leather padded cushion and modern metal construction will look good in any entryway. It even has plastic pads for the bottom of the feet to protect your floor! It is anti-rust and scratch proof as well. Although it doesn’t have any extra storage for keys, mail, or other small items, I felt that its strength, pleasing design, and price more than made up for it. It will keep your shoes organized in style and give you a place to sit to put them on or take them off. 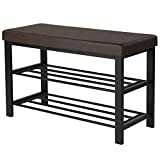 Id also like to point out that this bench would be a welcome addition for any bedroom or bathroom where extra storage and a place to sit might be needed. It’s easy to imaging a beautifully folded stack of towels on the lower shelves nestled near the tub. This small entryway shoe bench would be perfect for a dorm room, small apartment, or inside a small closet. It is wallet friendly for those on a strict budget. It is light enough to be easily portable. It is made of 100% bamboo making it eco-friendly. It’s easy to assemble and ships in a small package (for those of you without a large porch to have packages left on). On the down side, the small size may not be sufficient for a large family and it isn’t as elegant or classy looking as some other models. Unlike the benches above, I could see this one being put out on your porch or patio and used to hold plants should the entryway plan not pan out for you. Avoid the possibility of being embarrassed by unexpected guests, make your entryway inviting, keep it organized, and have a place to sit while putting on or taking off your shoes by purchasing an entryway bench with shoe storage. The best entryway benches are made of sturdy materials, have aesthetic appeal, have space to easily store everyone’s shoes, give you a place to sit, and have extra storage for small items that accumulate by the door. For these reasons we chose the Winsome Dayton Storage Hall Bench with shelves as our #1 choice. Even though our second budget choice, the SONGMICS Metal Shoe Bench, did not include extra storage for small items, its sturdy construction, ability to hold up to 440lbs, and pleasing look more than made up for it. Finally, our compact space choice, the Ollieroo, has space for shoes and small items, is made of 100% bamboo, and is perfect for dorm rooms or small apartments. I really don’t believe you could go wrong with any of the three. If you do pick one up please stop back by to show it off to us!